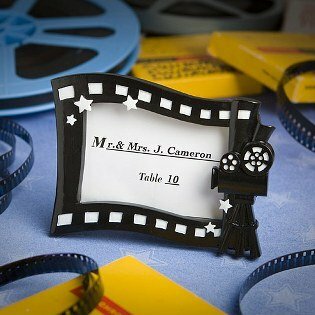 This Hollywood movie themed place card/photo frame is a blockbuster favor your "audience" will love Here's an all occasion favor with lots of star power. And, this versatile frame is a scene stealer that will dramatically hold your event day place cards and photos when your guests take them home. Each black poly resin frame measures 3 ¾" x 2 ¾" with a black and white design featuring a film reel and vintage movie camera and scattered stars. Each has a 2 ¾" x 1 ¾" photo window and a hinged black craft paper back for easy photo insertion. Sure to receive a big thumbs up at Hollywood themed events, proms, Sweet Sixteens, Bar and Bat mitzvahs and more, each Hollywood picture/place card frame comes with a blank place card included in a white box. If you have any questions about this product by FavorWarehouse, contact us by completing and submitting the form below. If you are looking for a specif part number, please include it with your message.